Midnight Sun, Ebony Masterpiece, Triple Threat, Sun's Delight D. plus four lines to Last Chance through Wilson Snip's Chance. 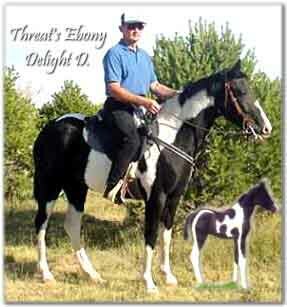 Threat's Ebony Delight D.'s pedigree traces its' Tobiano to The Foundation Tobiano Tennessee Walking Horse. Click below to read history.